In the meantime, heat a large pan with the olive oil, over medium heat. Add in onion and tomatoes and cook, stirring often, for about 5 mins. Season to taste. When the water boils, drop the pasta in and cook al dente, about 2-3 mins if using fresh pasta. 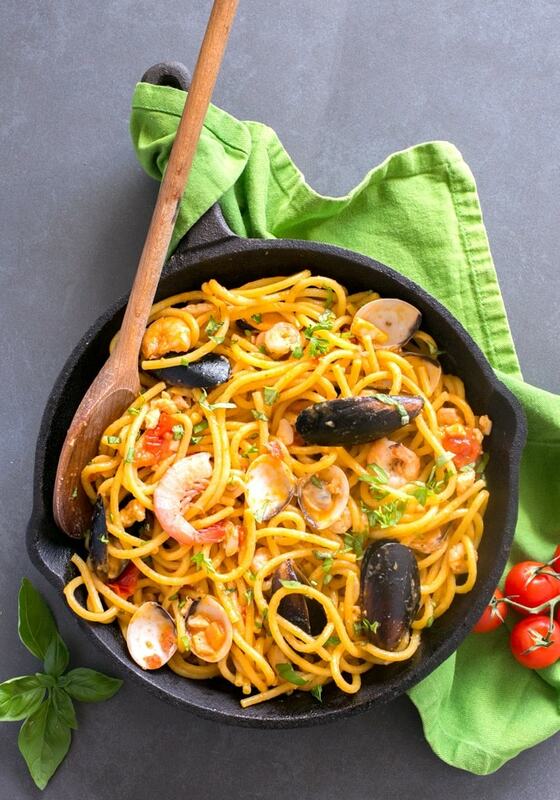 Transfer the pasta into the pot with the seafood sauce and stir all ingredients together. Sprinkle with lemon zest, freshly chopped basil and parsley on top, and drizzle with a little bit of extra olive oil if you like. Serve immediately, family-style directly from the pot.